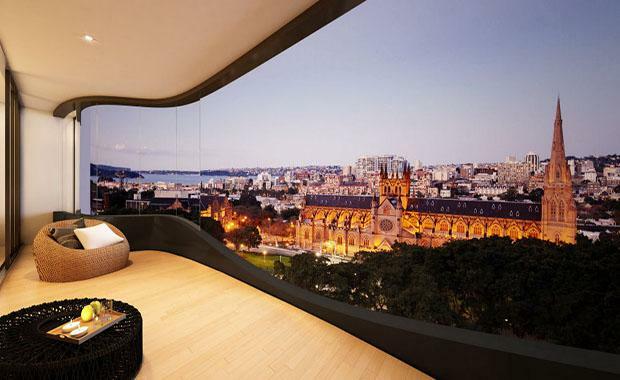 A lavish $15 million, three-floor penthouse in the heart of the CBD, has created a new and exciting architectural look for Sydney. The penthouse is 499 square meters and is perched on top of the Eliza apartment building on Elizabeth Street, next to the five-star ‘Sheraton on the Park’, with views overlooking Hyde Park and Sydney Harbour. The penthouse has four bedrooms, six bathrooms, a private lobby, and an internal lift. The ceilings are 3.8 metres high, which is 50 per cent higher than average Sydney apartments, with rooms with expansive walls to accommodate artworks. With the first two floors being dedicated to living, sleeping and dining areas, the top floor is dedicated to being an ‘entertainer’s haven.’The rooftop level has a landscape terrace, an outdoor kitchen and a transparent infinity-edge pool allowing swimmers to look at the view, even when underwater. Adding to the ‘wow’ factor of the apartment, is the 10-metre high marble staircase that links each of the levels, and the master bedroom. The master bedroom is a 60 square metre space, with a private study and a walk-in wardrobe so large it could be confused with a small shop. The bathrooms and kitchens are equally as fancy, with the best appliances and materials used for both. The penthouse also comes with basement storage areas, three secure parking spaces and a discrete driveway. Real estate John McGrath said that he believes the penthouse is definitely worth the money. “It offers an unsurpassed lifestyle in what is one of Sydney’s most culturally significant precincts,” said Mr McGrath. The penthouse isn’t the only beautiful apartment in the building, with the other 18 apartments selling fast. Ceerose, which was founded by Edward Doueihi. “We’ve waited until the crowning glory of Eliza is fully furnished before inviting people to inspect the penthouse,” said Mr Doueihi. The building can be inspected through appointment only.